As a professional dog trainer, I’ve been able to work with various breeds of a large number of dogs over the years, ranging from 7 week-old puppies to dogs as old as 10 years or more. I strongly believe that one of the only ways to get better at anything, whether you’re talking dog training specifically or life in general, is to put in the work. And more times than not, the whole “work” part is where things start to get hard! Thankfully, I’ve had a lot of opportunities to put that work in when it comes to the dogs. And, consequently, I know I have gotten a lot better as the years passed. As I have personally improved, the dogs have mirrored that improvement as well. Today, I can say with strong confidence that when I have a chance to work with a puppy or dog, I will be a positive influence on them and my hope is they are better off because of it as well. But what about the people when it comes to training? I think that one of the most overlooked factors when it comes to training, or as I prefer to say, “raising” dogs or pups, is the importance of what the trainer brings to the equation. One of the most desirable traits all dogs possess is that they want to please and are naturally looking for a strong leader. That is simply how they are wired. On the opposite hand, one trait that they also have because of this wiring is if they don’t find a leader they will become the leader. 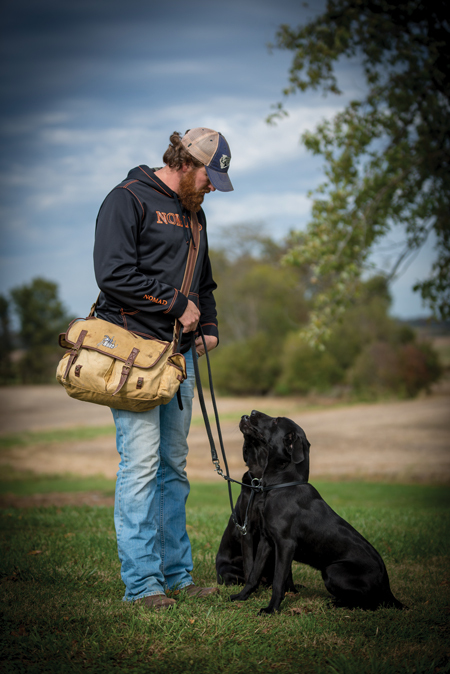 The great majority of training topics and articles I have written over the years and have read for that matter, have revolved around dogs in the field and how we prepare them for “the hunt”. It’s the hunt that is the most fun to talk about. It’s the hunt that is the most exciting. And why not? I mean, the hunt is what so many of us have as the end goal right? The hunt is the fun part, and in all reality the hunt is what comes the easiest for most dogs. Hunting has been bred into them for centuries and is relatively natural. As their handler, our job is to simply bring it out. It’s the other stuff, beyond or before the hunt, that most struggle with and typically that is the reason things fall short. Although the majority of what I have read and written about has focused on the hunt, what’s interesting to me is that the great majority of questions I receive by phone call, text, posts or direct message on the various social platforms, and even when face to face at seminars and shows is centered around the basics. It seems most struggles and headaches are not due to dogs that won’t handle well on challenging doubles and blind retrieves. It’s rare that I am asked what to do when your dog stops to the whistle out beyond 100 yards but doesn’t want to face you in order to take a good hand signal. (Recall the dog a step or two in order to square them up, stop them again and then cast…btw)  Instead, the questions that come up over and over are almost always related to their dog’s foundation, or more accurately their lack of foundation. Now, I’m certain that the direction this article is taking following that last line will have some folks turning the page. Nowhere ever, have I read about the idea of “foundation” being described as exciting, fun, easy, or the overall end goal. But the truth is, most struggles are directly connected and the majority of dog owner’s struggles are rooted there. I also find that the reason most struggle with the foundation is because they just don’t know how or what to do in most situations. One of the most commonly asked questions I get about our dogs is, “How do you keep your dogs calm?” This question usually comes when I have multiple dogs ranging in age lying quietly at our feet on their “place” amongst a lot of distractions. I am asked constantly how to handle pups that are just full of energy? I hear about how their dogs must need to have more exercise than others but because of work, kids, school…the list goes on, all the reasons they just can’t seem to do enough to wear them out. I’m asked how much time I spend running my dogs in order for them to always seem to be calm and under control. The reality is, I wish I were able to run and exercise them more. In fact, it’s likely that I might give the dogs I’m training less physical exercise than the dogs of those asking the question. So, what’s the difference? I think the difference lies greatly in the culture that the dog is being raised in. Here is an easy idea to understand-  a dog’s body is no different than the human body when it comes to their athletic conditioning. The more you exercise, the greater your endurance becomes. The greater your endurance, the longer it takes you to tire or wear out. Why would this be any different with your dog? In an attempt to physically “wear them out,” they are actually conditioning them to simply be better athletes which will in turn take more to tire them. It’s a snowball effect, in the wrong direction. See maybe if this example sounds like something you can relate to:  You got to bed last night later than you had hoped because you stayed up to finish a project for work or school (or you had to finish your article for The Badger Sportsman Magazine…nevermind, that’s me!?!) You hit the snooze button twice and now you are rushing to get the kid’s lunches made and ready for school or work. In the midst of all of this, you let the dog out of the kennel and then back in after the morning’s food and water. Off to work, then back in the evening only by rushing home to let the dog out of the kennel quickly before grabbing a dinner on the fly and then out the door again to basketball, soccer, baseball, football, gymnastics. Day after day, your specific routines and reasons may vary some, but the pace is constant. It’s FAST and HIGH ENERGY. How can you expect your dog to slow down if that’s not the culture you are instilling in them? Now your schedule doesn’t have to be exactly like that, but you get the idea. The speed at which we move and the amount of things we take on these days is scary. In a lot of ways, it’s great and with the help of technology we’re able to be much more efficient, get more done and pull it all off faster. But, I have to remind you that dogs are not interested in technology helping them to become more efficient, and getting more things done faster. We, and our society, have changed greatly over the last several hundred years. However, our dogs have not changed one bit. They still learn by forming habits and habits are formed by repetition and consistency. Their behavior is influenced greatly by the culture they are raised in. That repetition, consistency and culture comes from us as their leader. When you think about it that way, it’s not a lot different than the process of raising a child. I literally see people that are in such a big hurry with their lives schedule, they will jump on an ATV or UTV in order to get their dog’s walk in (which ends up being a sprint). Look back on what happens before these runs. The dogs go from zero to 100 miles per hour when they are in any kind of contact with us because they match our pace. When we take dogs out in a hurry and have them run for miles behind an ATV with the idea that they need the exercise and that this will help “burn off energy,” I think the owner’s heart is in the right place, but unfortunately they’re trying to put out the fire by pouring gasoline on it. The faster, harder and more you run your dog, the faster, harder and more your dog will be able to run. So what can you do? I do think there are a few easy things we can do to work on this by simply changing the culture. But if you remember what I mentioned early on in this article, “More times than not, the whole work part, that’s where things start to get hard!”  We need to take a good look at our lives and how we operate day to day. Think about your schedule and instead of simply trying to figure out how to get more miles in, see how well your dog can focus while covering a 1/10 of the distance, but under great control while in the heel position. Vary and set the pace in everything you do. When your dog is part of the equation, slow that pace down. If your dog wants to go fast (and the “excitable” ones usually do) you need to slow down to counter that. In training, I often talk about the importance of balance. This is another example of when it needs to be found. You might break up the walk with 2-3 minutes of just sitting still. Two or three minutes doesn’t sound like much, but if you’re used to a fast pace with everything you do all day long, stopping and standing still for that amount of time can feel like an eternity. From that, add layers into the exercise that will challenge your dog to have to think about what they are doing instead of just mindless physical exercise. Mentally stimulating our dogs within their routine of physical stimulation can be by far the most effective way to “wear them out”. By simply doing a few things like this, you begin to work towards building patience in both your dog as well as in yourself. The best way I have found to speed things up when it comes to raising dogs is very simple…just slow things down. Best of luck to you in your training! The post Raising Dogs appeared first on Morning Moss.